If you’ve decided to go low-carb, Paleo or gluten-free, you may be having your own private pity party memorial service for all of those yummy, fluffy, cakey baked goods you’ll never get to have again. But before you sink into the depths of despair and resign yourself to healthy fruit desserts for all of time, just know that in the world of healthy eating, there’s almost always a workaround. 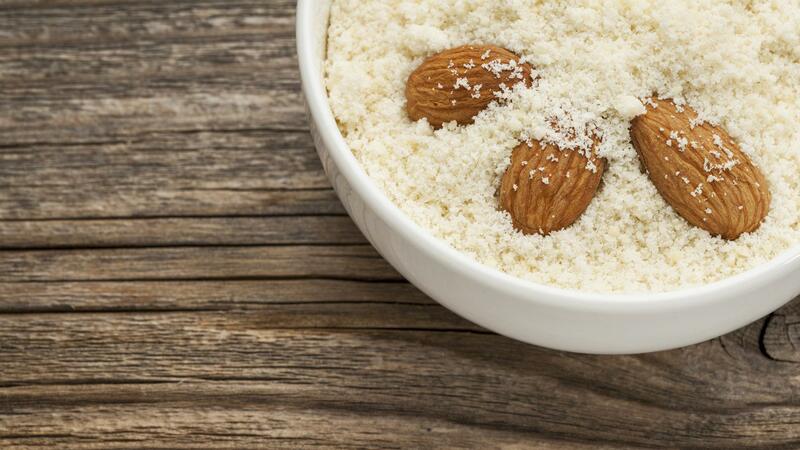 Almond flour is one of our favorite swaps for the regular flour that’s now off-limits. Why cook with almond flour? Like sugar, there are several options for replacing flour, including combinations of soy or whey protein powders, ground flaxseeds and also soy flour. I prefer to use as many natural and whole ingredients in my recipes as possible. I like to use nut flours — and almond flour works excellently in many recipes. Not only is it high in protein and low in carbs, it’s a good source of omega-3 fatty acids, shown to be essential for brain and heart health. Almond flour works very well for practically all cake and muffin recipes, pancakes and some cookie recipes, too. It can also be used to make tart shells for sweet or savory dishes. The only types of dessert that do not lend themselves well to the use of almond flour are yeast bread or other non-quick bread recipes. Almond flour can either be bought directly from the store ready-ground or it is possible to grind your own at home from natural almonds in a coffee grinder or something similar. It doesn’t even matter if you don’t like almonds because, strangely enough, baked goods made with almond flour do not taste of almonds unless you deliberately add almond flavoring. To convert any regular baked recipes to low-carb using almond flour, experiment by simply replacing the volume of flour in the recipe with the same volume of almond flour. Use slightly more rising agent than the recipe suggests to allow for the heavier weight of the almond flour. Be sure to butter and line your pans with baking paper to help prevent sticking. After baking, foods made with almond flour do better if you leave them in the pan a few minutes before loosening carefully with a knife and turning out because the texture is generally more fragile than recipes made with wheat flour. Now that you’ve got the basics down, you’re ready to try out almond flour in three of our favorite recipes.